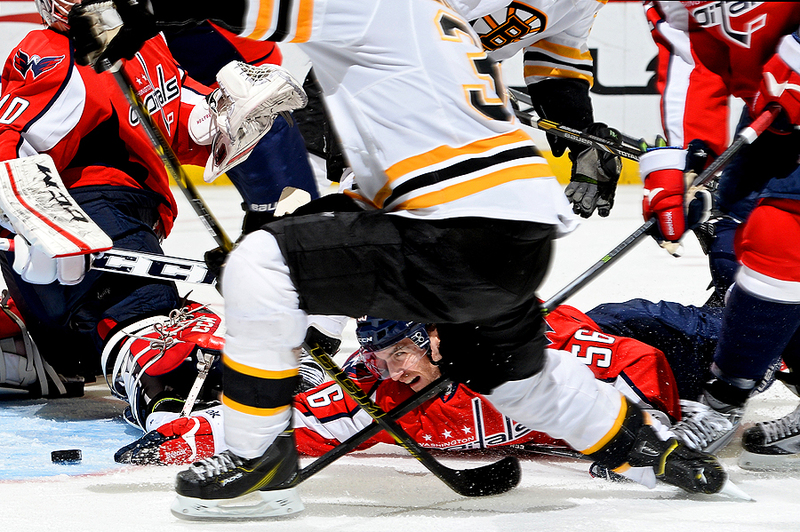 "Patrick Wey #56 of the Washington Capitals dives and reaches for the puck in attempt to stop a goal by Patrice Bergeron #37 of the Boston Bruins in the third period during an NHL game at Verizon Center on March 29, 2014 in Washington, DC." In the world of professional photography, it's easy to get caught up in the digital age of high-end cameras and their impressive specifications. With these monster cameras shooting more than 10 frames a second and sensors reaching upwards and onwards of 20 megapixels, everyone wants the latest and greatest camera to help them capture the peak moment in a fast-paced world. With that in mind, I recently covered for a friend, teammate serving as the team photographer for the Washington Capitals for a night. For the most part, everything was the same as if I covered the game for any other editorial client, so I wasn't too nervous. However, one factor that was very different was shooting on strobes instead of available light. Rather than shooting 10 frames a second on action and emotional storytelling moments, I had to choose when to fire the camera with thought, patience and precision. In the end, it was very challenging, as it's something I haven't done in a couple years. Yet it was very rewarding as it makes you focus on the fundamental skill of timing. In a period where I only shot 67 frames, I think the above is a perfect example of getting a decisive image with just one frame. When that's all you have to work with, it gives you even more respect for the team photographers that work on strobes all season. Their images are continually inspiring as they shoot them one click at a time. "Tiger Woods plays a shot on the second hole during the final round of The Honda Classic at PGA National Resort and Spa on March 2, 2014 in Palm Beach Gardens, Florida." When a photographer shoots at a new venue - be it an arena, course or stadium - there is a breath of fresh air. Most of the time, this new environment is wonderful only because their eyes haven't seen any of it before. As one can imagine, golf courses meet those descriptions, as they're beautiful landscapes that tend to be very graphic. However, the thing is with golf is that it's a four day event. So as excited as one can be on the first morning, before a photographer knows it, they're shooting the same tee box time and time again doing their best to be consistent and compelling. 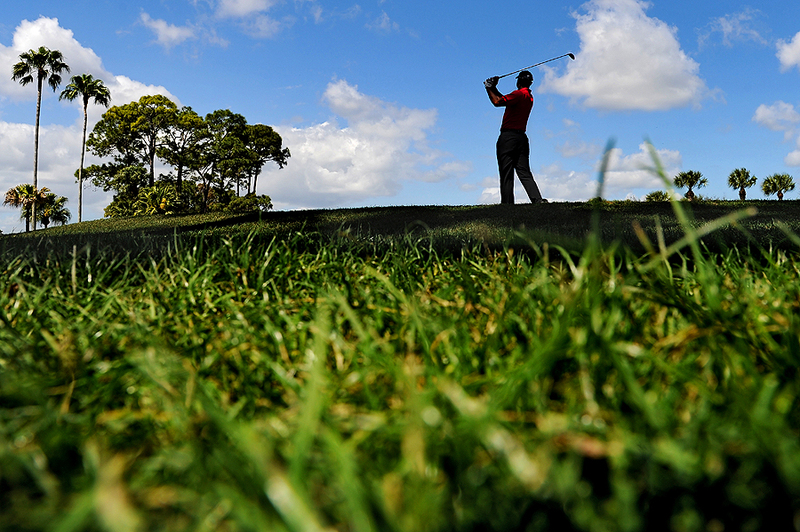 Tiger Woods had been making a small run and hit the course Sunday in his classic red. But with more photographers following him on the final round, the location I wanted to shoot from to try and photograph him from for a fresh perspective would mean getting in others background. As he approached the tee box on the second hole the light was changing across the grass and I improvised. A familiar scene looked completely different - when there is light, there is color. Sometimes all it takes is mother nature and the wind to move the clouds to make a familiar scene not so ordinary. 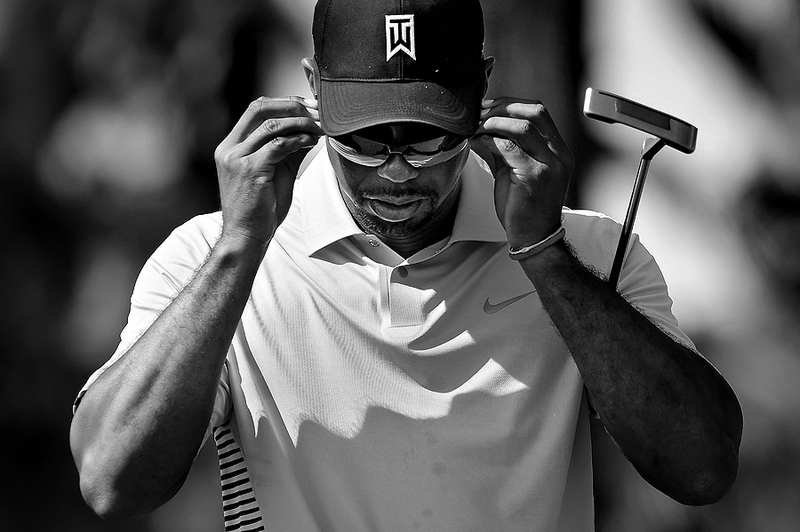 "Tiger Woods puts on his sunglasses after playing a shot on the eighth hole during the second round of The Honda Classic at PGA National Resort and Spa on February 28, 2014 in Palm Beach Gardens, Florida." Waking up early is always difficult - but when one is excited it makes the rising before the sun easy. In Florida, my new second home this year, I had the opportunity to edit, and shoot a little of, The Honda Classic in West Palm Beach. Because I was editing the tournament for the team, there was no real direction for shooting in the mornings. So I decided to direct my attention toward some of the storyline golfers each morning for an hour or less. I tried to look for some different angles and break away from the other photographers in the pack. And while I found some unique light and moments, the above simple shot of Tiger Woods stuck with me for some reason. 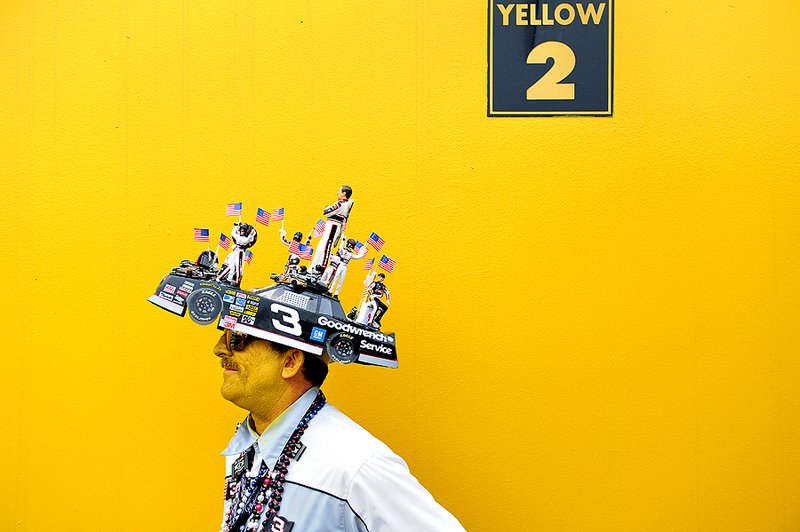 "NASCAR fan Tony Wright wears a hat remembering the late Dale Earnhardt Sr., as he poses in the garage area during practice for the NASCAR Sprint Cup Series Daytona 500 at Daytona International Speedway on February 22, 2014 in Daytona Beach, Florida." Had you asked two years ago what Speed Weeks was - I couldn't have answered the question. However, fast forward to 2014 and I now know the inside and outs of the two week event in Daytona Beach, Florida. When I got my initial layout of my annual schedule, I was humbled to be included on the 14 day assignment in Florida with Getty Images. Being teamed up with the best motorsports photographers, teammates in the world was nothing short of an honor. It was a great time of year to escape the cold, snowy weather of Baltimore and get to the warmth and sun, but what I didn't know was how hard we'd work as a team. Over two weeks we covered endless practices, multiple qualifying sessions, driver appearances, fans having fun, seven races, and much more. A rewarding time, I learned a lot - and walked even more. I stepped more than 175,000 times for a total of roughly 85 miles. With that said, here is a very loose edit of my favorites from the time in Daytona. Be sure to check out the entire team's take on Getty Images site, too. So many compelling images that one must see. "Reverend Dan Petfield of Racing With Jesus Ministries prays with Brennan Newberry, driver of the #24 Qore24 Chevrolet (L) and Daniel Suarez driver of the #6 Sunoco Racing Fuel Toyota (R) before the start of the NASCAR K&N Pro Series East UNOH Battle at the Beach race at Daytona International Speedway on February 18, 2014 in Daytona Beach, Florida." Finding quiet moments in auto-racing can sometimes prove to be challenging. In a sport where most of the time athletes are shielded by a full-face helmet, a 700-horsepower machine, or a pit crew - documenting these type of moments isn't typical. When it does happen, it takes good access and patience. After a driver wins the big-race they display to the world how happy they are. But leading up to the triumphant celebration, rarely do you see peaceful moments shine. This is only because the athletes spend a majority of their time behind the wheel - and it's near impossible to document how they feel when all a photographer can see is a race car speeding by. But silent moments still exist when access is granted throughout the day - and these are usually found on my favorite part of the track - the grid. Much like the other series, the access was great on the grid covering the NASCAR K&N Pro Series Battle at the Beach race at Daytona International Speedway. I found the assignment very rewarding as photographers had a bit more of a leash in terms of coverage. When access is good, viewers get a glimpse at the world they seldom get to see from their seat in the grandstand or their couch at home. 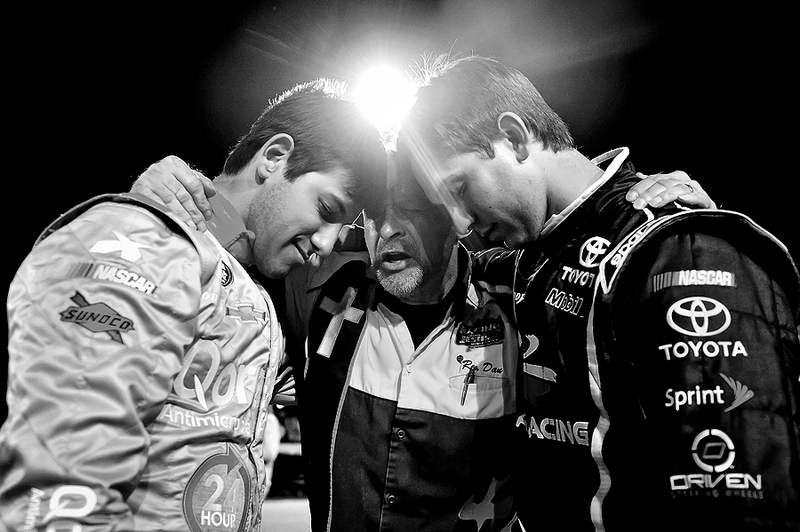 At the end of the day, it was a nice juxtaposition to see how driver Daniel Suarez spent pre-race praying before he celebrated in victory lane post-race after winning the race.